I am a neophyte when it comes to baking. I shouldn’t have volunteered to bring a cake for Friday night’s event and then showed up with nothing! I realized after the fact that it must have increased your stress level. I am SO sorry. If that ever happens again, I will at least go to the store and get something to replace it. I honestly didn’t even think about it till afterward… and then I was horrified. And so I learned the hard way that, when baking, to leave enough time to either make or purchase a replacement if it doesn’t turn out. All in all, I am proud to say that this mishap did not turn me off baking completely and Betty’s still my friend. Now, how did this, what was supposed to be a fluffy, fruity cake, turn into such a tough sugar cracker? 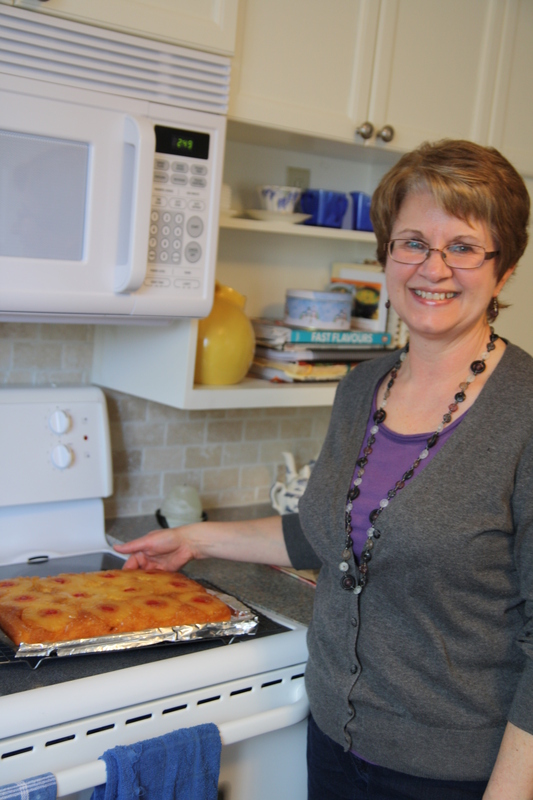 Lynn graciously agreed to a priority lesson last week, where we reproduced the whole recipe from scratch in her newly renovated kitchen. Kitchen renos are an interesting affair. They can turn a room you tolerate into one you develop real feelings for. I remember years ago when we had one done. We went from putting up with a galley kitchen to a new state-of-the-art reno that rivaled the affections of my husband and kids; it was my favourite place to hang out and I didn’t even cook! (And thus began my return to the kitchen.) We sold our house in 2006 and 7 years later, I am still upset that I had to say goodbye to that kitchen. I remember Lynn’s kitchen before the renos. 70’s light oak cabinets, somewhat cramped… that was the place she spent the most time in (obviously it was something more than the room that kept her in there) and it’s now a lovely, open, sophisticated space. 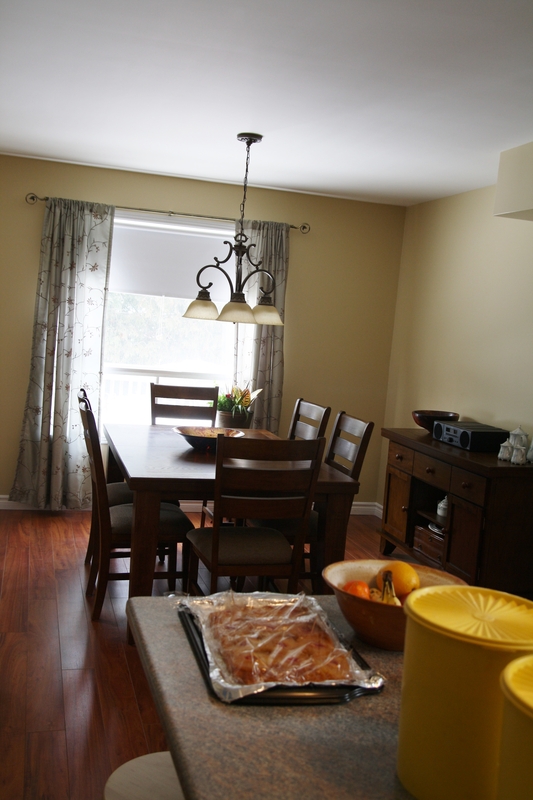 She tells me all the work that went into it, “A wall was knocked out, new floor put in, cabinets painted, new appliances, new hardware, crown moulding, new backsplash, new furniture and counter top, island…” The island’s her favourite because people can talk to her while she cooks/bakes. Who is this Lynn Lady? But I should formally introduce you to Lynn! Lynn is the wife of the interim lead pastor at our church. How timely given my recent post about pastor’s wives. In some ways, Lynn is the picture-perfect pastor’s wife because she’s good at everything and is kind to boot. But I wouldn’t want to say that’s because she’s married to a pastor, it’s who she is. Even so, I am very glad she came to our church after we were well-established because if people had in their head that SHE was the example of how a pastor’s wife should conduct herself, I’d be in big trouble. Lynn is a retired (just this past fall, whoop whoop!) elementary French teacher. She quilts and sews and knits. She is musical too; she sings with the voice of an angel and is currently learning the cello for kicks. She also bakes and by that I mean she has that special quality that make people thrilled when she does (some of her treats that I’ve tasted are, dare I say it, magical). She is gentle, smart, creative and fun. See? Perfect. Despite our age difference and her perfection, she’s a good friend of mine. Lynn’s surprise came from the fact that she hadn’t had it in years. Come to think of it, neither had I! 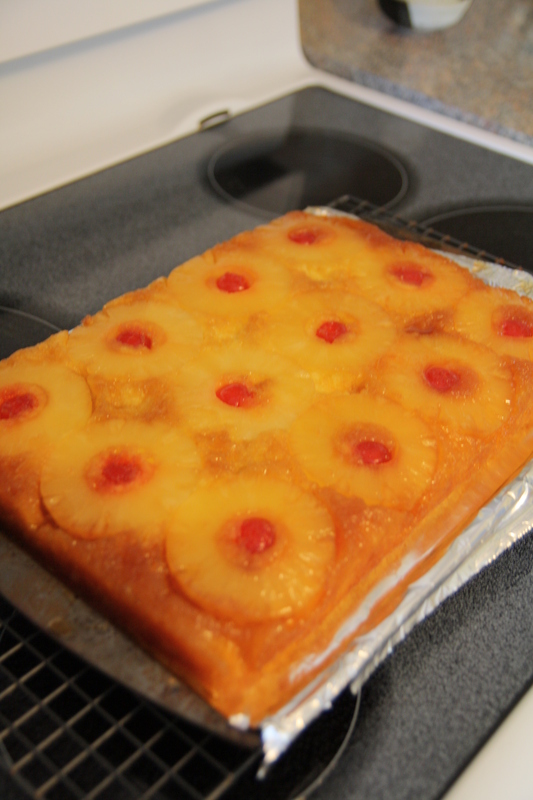 Come to think of it, when’s the last time YOU had pineapple upside down cake? Probably around the same time you had a jello salad, right? Well, maybe it’s time to bring PUDC back! I did a little online research about ye olde cake and saw that any recipes posted use descriptors such as traditional, old-fashioned, grandpa’s favourite, 50’s flashback, kitsch, classic, time-honoured. There is vintage in this here combination of fruit, sugar and flour! It seems that this creation was brought about by the introduction of tinned pineapple by a certain James D. Dole, founder of the Hawaiian Pineapple Company, at the turn of the last century. A few years later the resourceful Mr Dole, clearly an indefatigable innovator, devised a machine that cut the pineapple into rings and then launched a competition asking for recipes for this miraculous product. We know that by 1925 the upside-down cake was established and became exceedingly popular. In 1951 it was possible to buy a Py-O-My Pineapple Upside-Down Cake Mix, which included not just a cake mix but “a can of perfectly blended pineapple, brown sugar and cherries. And I also found out that the cherries have been “a point of contention,” only put in there to fill the hole. Purists feel they are unnecessary. Lynn is a careful, precise woman. She set out the ingredients before I came. She made the cake herself ahead of time just to be sure of the recipe and decided that we would double it to make it thicker. (I have gone ahead and made the changes to the recipe listed in the first post.) She also said that some people just put the pineapples in and then pour in a white cake mix. Lynn pulled out her recipe. 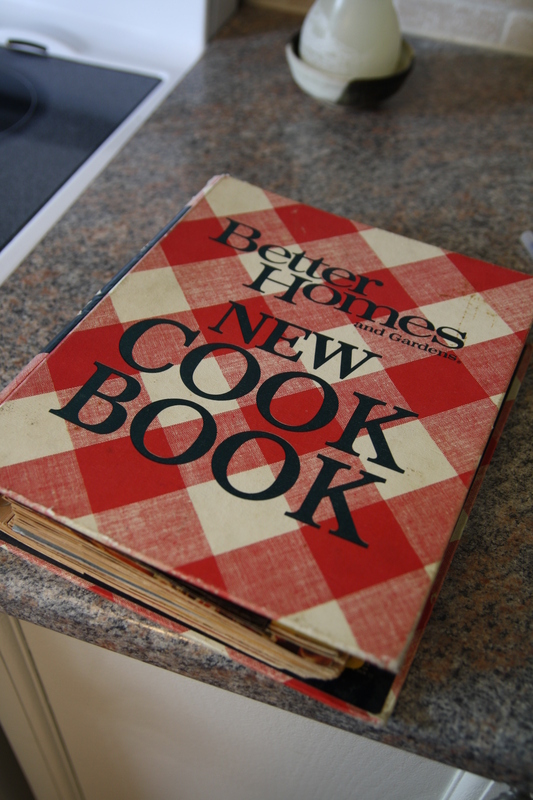 Speaking of retro, I also caught a glimpse of the cook book she’s had – and used – since she got married. In fact, she bought one for both her son and daughter for when they got married. On the Operation: Recipe Swap Facebook page, I asked how many people remembered this cook book. Never mind remembering it, they owned it! Never mind owning it, it’s their GO-TO cook book. It’s that trusted. 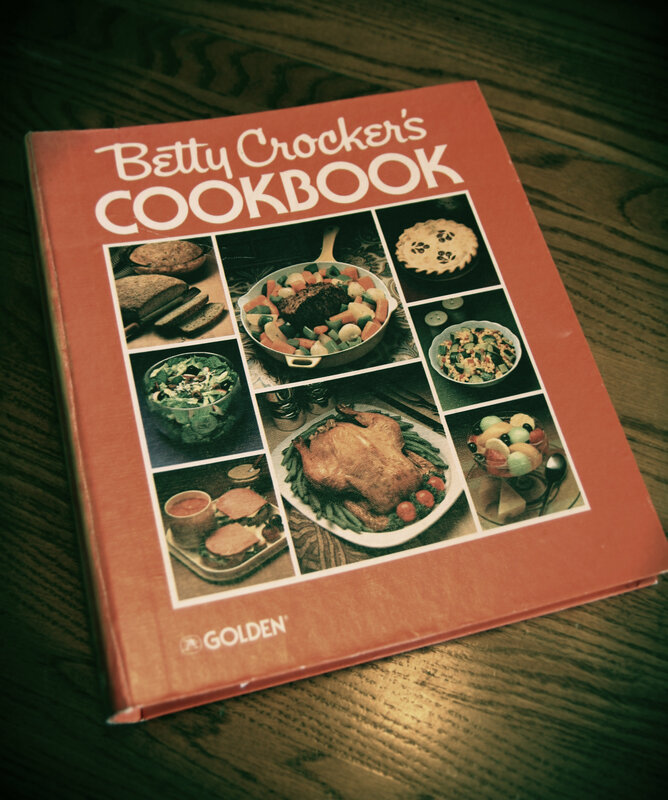 Other people talked about “The Betty Crocker Cook Book” as of the same calibre. People seem to have one or the other. 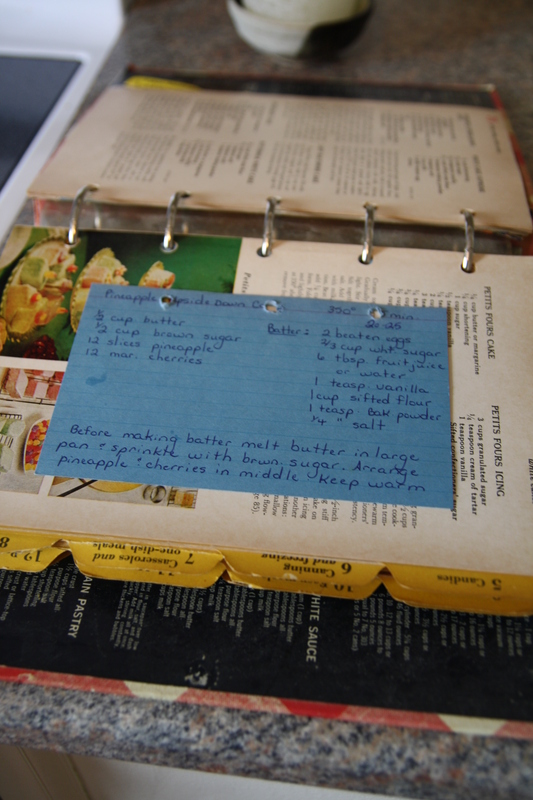 I went to our bookshelf and saw that we indeed own this book – with some markings on the recipes that John-Mark has silently made over the years. Made me pause to consider what a treasure he is. Without going through the whole procedure, I will just point out the areas that were at discrepancy with the way I originally made the cake and Lynn’s way. Any discrepancy, the difference(s) between how I made my cake and how Lynn bakes the cake, would then reveal exactly what went wrong. Even if you get most things right, going wrong on one part means disaster for the whole thing. Well, that discrepancy was quickly found. I should have paid attention to that inner red flag when (I thought) the recipe called for white sugar AND brown sugar in the cake batter, but I shrugged my shoulders and threw it all in together anyway. Turns out the white sugar is for the batter, the brown sugar was to be sprinkled on the bottom(top) of the cake. The brown sugar, pineapple and cherries are the topping. We’ve been talking a lot about substitutes on the Facebook page, well think of these three ingredients as a substitute for icing. Did you know that? I later asked my mom if she knew that when you’re measuring brown sugar you– “Pack it in?” she asked. So. Common knowledge then. Lynn taught me to be resourceful too. The recipe calls for drained pineapples and Lynn kept the juice. Later, when adding “water or juice,” so we just used what we drained from the tin of pineapples. I’ve experienced this resourcefulness before – Lisa Bickle kept the yolk when we separated the egg white in the gingerbread cookie. I think she was going to use it in an omelette or French toast. One’s resourcefulness can potentially increase as you bake more often. 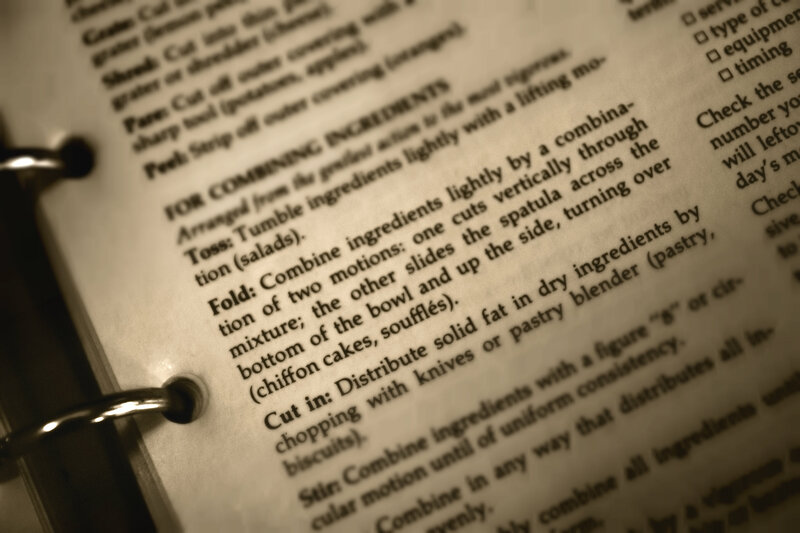 I was stuck on what it meant to “fold” the ingredients together. I remember looking at the ingredients in the bowl and thinking, would I grab the edges with my hand and pull it into the centre, like I would a t-shirt? The Betty Crocker cook book was no help. Can you decipher this? Lynn clarified the terminology for me, “Beating you do to make something smooth. Folding you just blend the ingredients gently, so it’s all mixed together, but it’s going to be lumpy.” Plus she added, “You should do that for muffins too. The lumpier are they are, the thicker the batter, the cakier they are. If not, they will be flat and spongey.” How little did she realize that she hit close to home, she opened a source of stress, tension and elementary school failure. In that simple statement, she gave me freedom. Yes, I’ve known flat and I know spongey too well and now I know why. On the heels of this revelation came a surprise feeling of frustration. “But how can you know all these things? !” I asked Lynn. “Well, how do you know unless someone shows you,” Lynn empathized. And yes, my friends are showing me. There’s no need to be frustrated. With Lynn by my side, I can see how adding too much sugar can mean disaster for a cake. With Lynn by my side, it bakes perfectly and turns out like this. Right side up and upside down pineapple cake baked to perfection, which we flipped onto a cookie sheet, not a plate. It didn’t break this time. But I am uneasy about baking on my own, branching out with all these tidbits and pieces that help you make baking a success. It’s not the most terrible thing to have to bake with a friend, but I am looking forward to gaining independence. 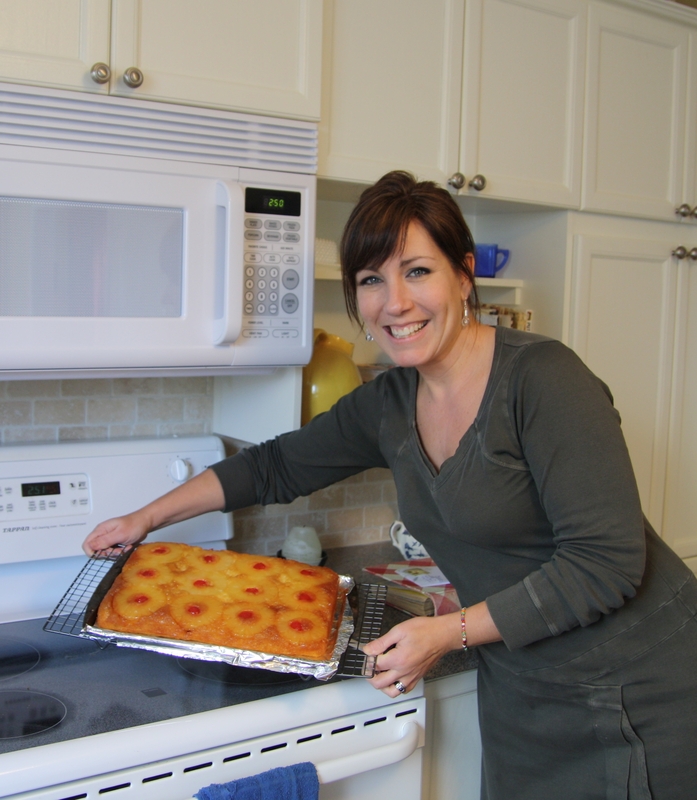 Speaking of patience, Lynn will actually be leading a workshop for our women’s ministry, baking 101. I figure there’s got to be one or two other people who have no idea that muffin batter should be lumpy, among other helpful hints. For the blurb that went into our “ads” for the class, Lynn indicated that it’s a great way to relieve stress and to express creativity. For now, I’m going on blind faith that her joy could my joy too someday. My turn! We made this!